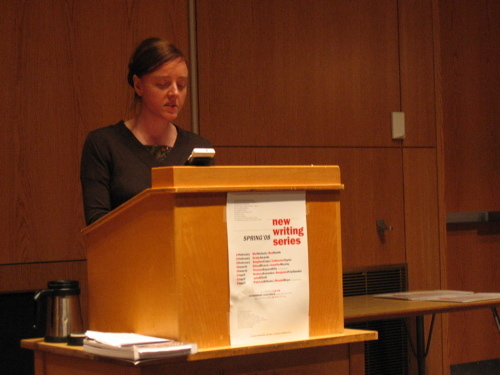 Fiction writer Julia Elliott read to an audience of approximately fifty people in the penultimate event of the spring 2008 New Writing Series on 10 April 2008. 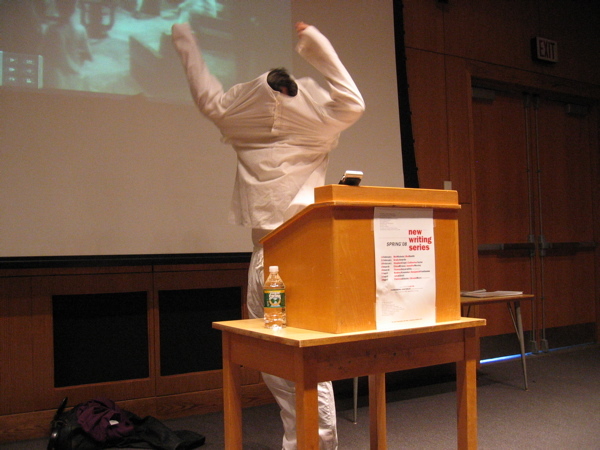 The event, introduced by David Kress, was recorded on digital videotape (vhs and dvd duplicates available soon) as well as both lo- and hi-end audio (thanks to Rebecca Griffin for the latter). A full set list follows the photo gallery below. For Kyle Kernan’s write-up in the Maine Campus, click here. 1) How long did it take you to write “The Whipping”? 2) How much personal experience went into “The Whipping”? 3) Did you revise “The Whipping”? 4) Was it particularly difficult to write the prayer scenes in “The Whipping”? 5) What do you think is the most important aspect of the short story? 6) Did you place alliteration in your story on purpose? 7) Did you find it hard to get “The Whipping” published? 8] Could you tell us something about your CDs [Elliot’s band “Grey Egg“]? 9) I noticed the inclusion of incongruous tastes and smells in the story; do you include that in your writing on purpose, and continually? 10) Was there more of the Arthurian novel included in “The Whipping” originally? 11) What’s the rest of your writing like, compared with “The Whipping”? 12) What does “texture” mean to you in terms of writing? 13) What/ who do you read? 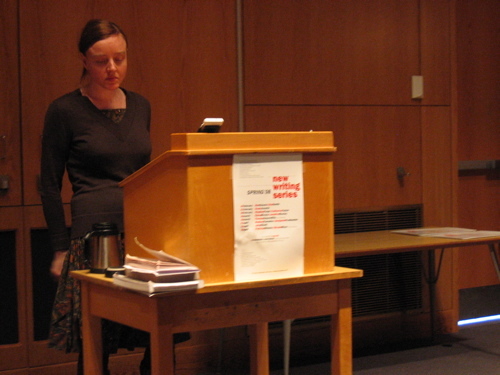 Fiction writer Julia Elliott makes her first appearance in the UMaine New Writing Series on 10 April 2008 at 4:30pm in the Soderberg Auditorium (Jenness Hall). Like all NWS events, this one is free & open to the public (though seating is limited). 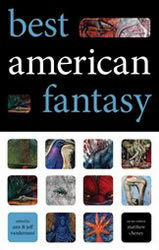 JULIA ELLIOTT’s fictions have appeared in Conjunctions, Tin House, The Georgia Review, Puerto del Sol, The Mississippi Review, 3rd Bed, Fence, Black Warrior Review, and other print and online publications. 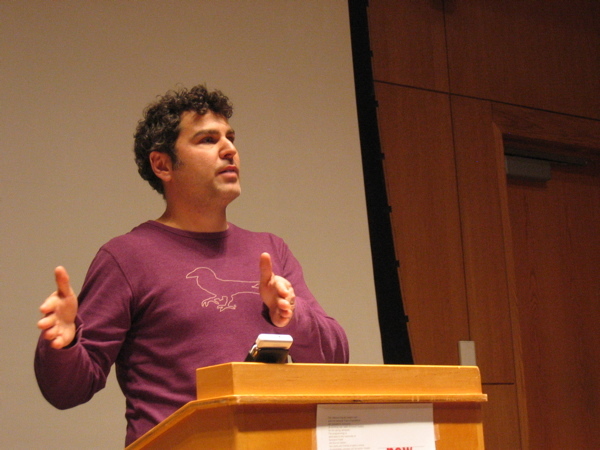 An instructor in English and Women’s Studies at the University of South Carolina, Columbia, Elliott holds a PhD in English from the University of Georgia and an MFA in English from Penn State University. 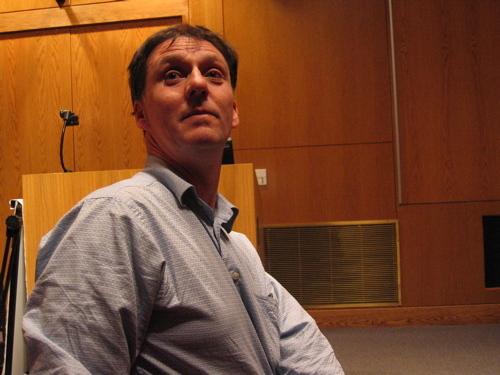 Besides appearing as one of the dramatis personae in Paul West’s teaching memoir Master Class: Scenes from a Fiction Workshop (Harcourt, 2001), Elliott’s honors and awards include being published in Best American Fantasy 2007 (Plume Books); listed in “The Hugo Awards that Weren’t”; included in StorySouth’s Million Writer’s Award, Notable Stories of 2004 (“the top online short stories of 2004”); listed as “Notable Nonrequired Reading of 2002” in Dave Eggers’ series The Best American Nonrequired Reading; and receiving the Great American Novel Award in the Virginia Festival of the Book (Virginia Foundation for the Humanities & Tupelo Press, March 2003). 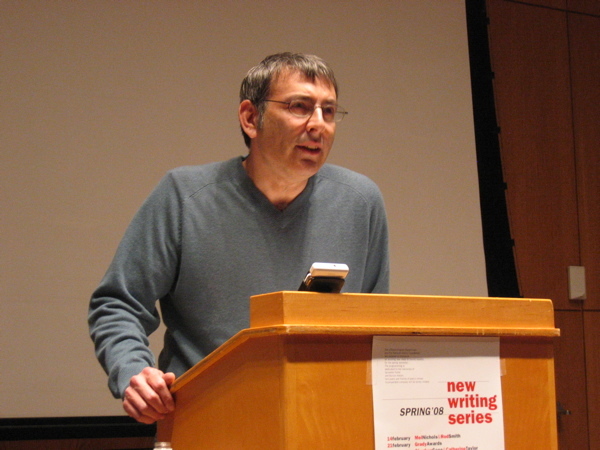 The event will be introduced by Assistant Professor of Creative Writing David Kress. Listen to tracks from previous NWS events on UMaine’s iTunes U. On Facebook? You’re invited to join the NWS group. Keep track of NWS events via LibraryThing Local. To learn more about the National Poetry Foundation, visit the new website. For more about the English Department, which offers Master’s Degrees in Creative Writing and Poetry & Poetics, click here. 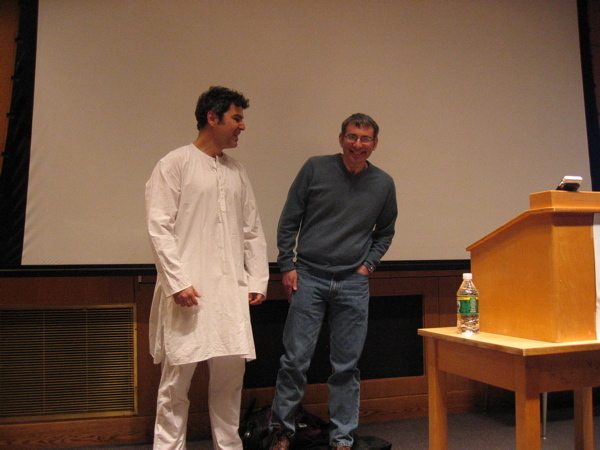 Poets Rodney Koeneke and Benjamin Friedlander read to an audience of approximately fifty people in the New Writing Series on 4 April 2008. 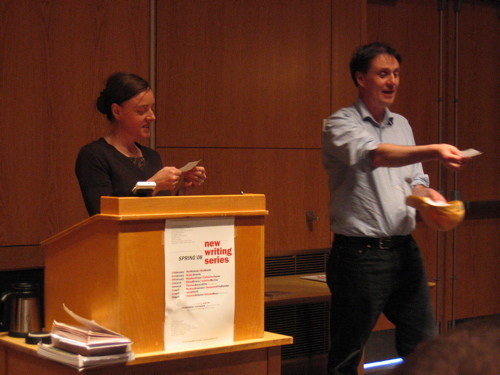 The event, introduced by Steve Evans, was recorded on digital videotape (vhs and dvd duplicates available soon) and, thanks to Rebecca Griffin, hi-end audio. Full set lists follow the photo gallery below. 3) #21 Sweethearts of what rodeo? 10) Europe. Memory. Squid Parts. Grace. 1) How do you use Google searches to help sculpt your [FLARF] poems? 2) (To Koeneke) Do you have any audio files of your poetry available anywhere? 3) For birthday poems, how/ what do you search? Is there a certain way you go about it? 4) How much FLARF do you write in comparison to non-FLARF poetry? 5) (To Koeneke): How long did it take you to write the “neo-benshi” piece? 6) (To Koeneke): Are you striving for persona-type poems? 7) Do you think writing can change things? 8] To Koeneke): You like performance—do you have any background in theatre?